While its pattern of mocking coverage of transgender teenagers has made The Daily Caller a notorious anti-LGBT cyberbully, the right-wing website claimed that the real bullies are organizations fighting to secure equal treatment from transgender students. Another public school has become embroiled in a transgender student controversy. This time it's La Feria High School in the southeast corner of Texas, just a few miles from the border between the United States and Mexico. The transgender student this time is 18-year-old Jeydon Loredo, a biologically female human being who wants to wear a dashing black-and-white tuxedo for her senior yearbook photograph. The La Feria Independent School District told Loredo in September that she can't wear the tuxedo for the yearbook photo. It violates a district dress code requiring female students to wear a blouse or something more traditionally worn by females in yearbook photos. 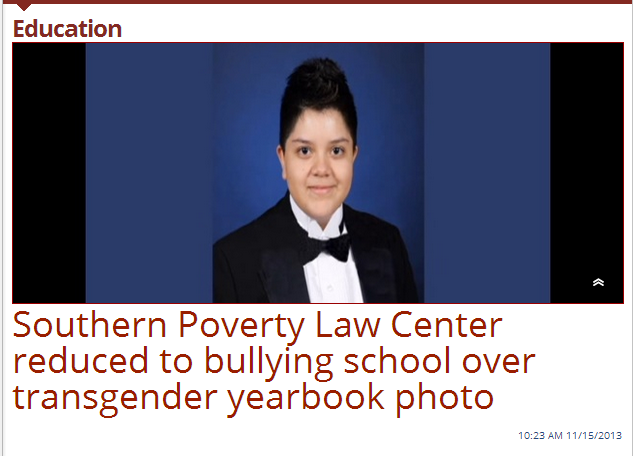 Loredo's family as well as the school district quickly managed to escalate the situation up to maximum unreasonableness, apparently, because now the Southern Poverty Law Center (SPLC) is involved. Alesdair Ittelson, an attorney with the far-left Alabama-based organization, assured The Brownsville Herald that the yearbook dress code is a violation of federal discrimination law. "Though Jeydon was assigned a female gender at birth, his gender identity — his internal sense of gender — is male," the SPLC said in a press release. The SPLC's letter noted that the school district's decision violated existing nondiscrimination policies in the district. Moreover, affirming transgender youth by using correct gender pronouns and allowing them to wear clothing in accordance with their gender identities is essential to their mental health. However, The Daily Caller has demonstrated repeatedly that it would rather stoke the climate of transphobic ignorance that contributes to disproportionate levels of harassment and violence against transgender youth.